Covenant Relationships: My Thoughts On The "Play" Video Memo Pad. Another Cosmopolitan parenting Idea? My Thoughts On The "Play" Video Memo Pad. Another Cosmopolitan parenting Idea? 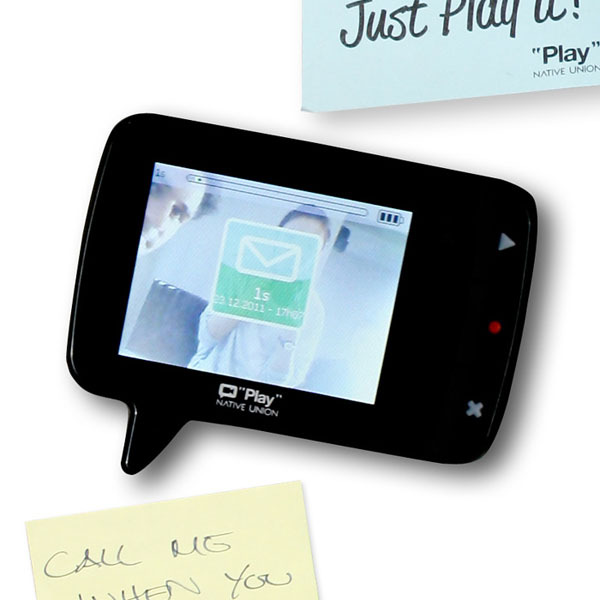 Hey guys, I came across a device by Native Union, called the "Play" Video Memo Pad which allows you record video messages and stick them on your fridge or any metal surface. Initially, I was like "What is the point of this device when we have phones and we can send text messages etc? It costs around $60 (N.9600). That would buy a whole load of sticky notes! But after I watched the video I realised that it might be a great cosmopolitan parenting idea. A lot of us still stick notes with reminders on the fridge; like "Take the soup out of the freezer"or "Leave some cheesecake for me" or a funny one on the box of my roommate's red velvet Valentine's cake in uni "Cut the cake with a conscience!" LOL. Sometimes we put pictures of the family held in place by a magnet alongside the latest crayon masterpiece of the family by the lastborn. It all makes for a ,more intimate home. And for the tech-savvy-gadget-obsessed teenagers who often check their phones an average 150 times per day this might be just the thing to use to share that proverb or some something encouraging with them while you remind them to take the soup out of the freezer to defrost, especially now that its the summer holidays and the kids are spending more time at home. I'm not sure, what do you think? Is this another cool "Cosmopolitan parenting" idea?